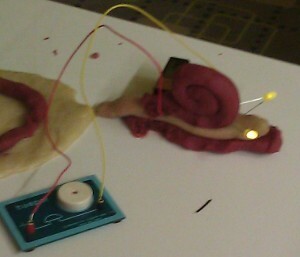 Tog will be hosting a Squishy Circuits workshop on Saturday 2nd of July, taught by Tríona O’Connell. Squishy circuits are a great way to demonstrate electrical circuits to kids (and adults!). It consists of a conductive dough and an insulating dough that are used in the building of circuits, along with batteries and more usual electrical components like motors and LEDs. During the workshop, we will make some batches of both types of dough, and afterwards we’ll see some useful demos you can use to teach with it, and also have some hands-on fun building circuits. Making the dough will involve lots of flour, so don’t wear your favourite black outfit, but apart from that there shouldn’t be too much of a mess. There’ll be demonstrations of how you can use the dough to investigate resistance in a circuit. And the fun part, building sculptures that incorporate electrics, or building giant squishy circuit boards. You can bring your imagination and build whatever you fancy. Tríona will be on hand to offer help or suggestions as needed. This workshop is free to attend although registration is required, as space is limited. It will last about 2 hours, starting at 2:00pm. You can use the form below to register. What to bring? Bring a 9V battery. Optionally, if you’re already familiar with Arduinos you can bring your own (this is optional and there’ll be plenty to do without one!). This was written by jpichon. Posted on Sunday, May 29, 2011, at 11:17 pm. Filed under Project, Workshops/Events. Tagged circits, squishy, Workshops/Events. Bookmark the permalink. Follow comments here with the RSS feed. Post a comment or leave a trackback. I’m a robotics teacher in Israel. I notices you’ve got experience creating squishy circuits. I tried using St. Thomson recipe, with no success 🙁 The resistance on the conductive dough was very high. What can you recommend? Adding sugar? What amount? Or maybe it’s the type of flour? I did try using distillate water and tap water.